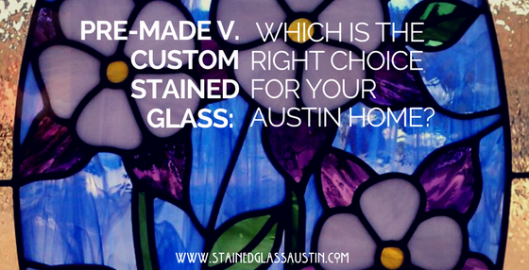 Pre-made stained glass is a great, budget-friendly option that’s perfect for any Austin home. With a large variety of different aesthetics, colors, textures, and design options, finding a stained glass piece that’ll compliment your home is a breeze. Our pre-made stained glass options range from modern to antique, offering a comprehensive range of designs. If you can’t find the perfect investment in our pre-made stained glass collection, custom stained glass offers free creativity for homeowners who want something personalized and unique. Custom stained glass is a more costly option but you get to work with one of our local stained glass artisans who can help you design the perfect piece for your Austin home. Custom stained glass begins with a consultation either in your home or in our stained glass studio. There you’ll sit down and begin hand designing your stained glass masterpiece. Our stained glass artisans input your collaborative design ideas into state-of-the-art rendering software allowing you to see the finalized product installed in your home. Once you fall in love with your stained glass design, we begin handcrafting your custom stained glass piece.